been added to the ongoing Avalanche Warning. 8:00 AM MST Friday March 8. Mountains, Rico Mountains, Uncompahgre Plateau and Dallas Divide. are likely. We may see avalanches of historic size. These avalanches will be very destructive and may run to the valley bottoms. elevations to the valley floors. 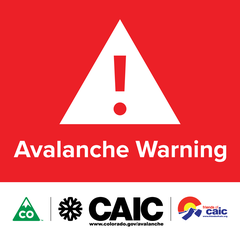 * PRECAUTIONARY/PREPAREDNESS ACTIONS...Travel in or below avalanche terrain is not recommended. Give avalanche paths a wide berth. Avalanches may run further into the valleys than you might think. Consult www.colorado.gov/avalanche for detailed information.